Thursday September 8th at 8:30PM the Sports Authority Field in Denver, Colorado will be the scenario for the first game of the NFL regular season… although they say time flies it goes by slow when there are no NFL regular season games to bet on; but the regular season will finally get underway, time to start following the games and bet on NFL to have some spending cash for Christmas. As we know, Broncos and Panthers met in February of this year for the Super Bowl 50, Broncos came out victorious with a win 24-10 over Carolina Panthers. What a better way to start this season than with a rematch between these two great teams. The Carolina Panthers were the favorite team to win going into the Super Bowl last season and despite having lost the SB and playing as visitors they are a -3 favorite again as they head into this first game. Originally the line opened at -1 for Denver, but changes in lineups for both teams and the betting action are working its magic and moving the odds for Panthers vs. Broncos. 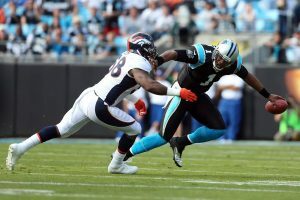 Certainly the Panthers have a great team with QB Cam Newton leading the pack, yet they weren’t able to capitalize on the opportunities they had in their last game against Broncos certainly Denver’s outside linebacker Von Miller had a lot to do with that, but Panthers need to show a more united front coming into this season. How well will Denver do without Peyton Mannning is the question everyone wants answered, and unfortunately for the Broncos that’s not their only sensible absence, Brock Osweiler, Danny Trevathan and Malik Jackson have all moved on to other teams and that makes Broncos a completely different team; their starter quarterback Trevor Siemian has a tough task ahead specially when facing a talented veteran like Newton. When it comes to the Panthers, offensive lineman Chris Scott is suspended for the first four games due to a violation of the league’s policy on performance enhancing drugs ; defensive tackle Vernon Butler injured his hand during practice and is out of Thursday’s game, the other two players reported injured are linebacker A.J. Klein and defensive back Dean Marlowe. All things considered the line given by oddsmakers makes sense, yet I believe Denver has a strong enough team to pull a positive result with the +3. Total Line is currently 42 and I think the under is the way to go. Remember that during this NFL Regular Season you can find the most competitive lines ad props to bet on NFL at Ace Sportsbook, get your account set up now if you haven’t yet and enjoy wagering on the NFL 2016; Live Lines on NFL are also available!